We are exactly 10 days away from Thanksgiving, and I’m already getting into celebratory mode! 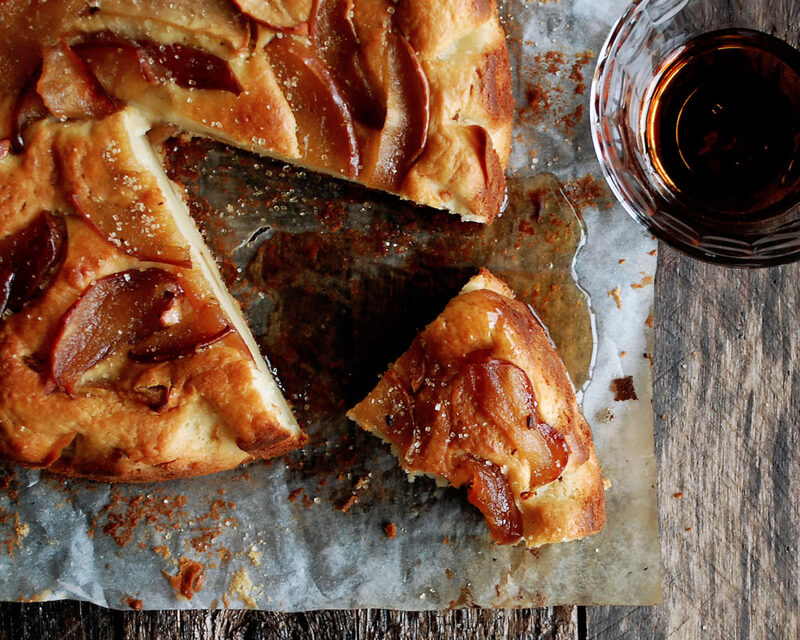 Especially with this maple apple ricotta cake. For a while now I’ve read about Bon Appetit Magazine’s raspberry ricotta cake. 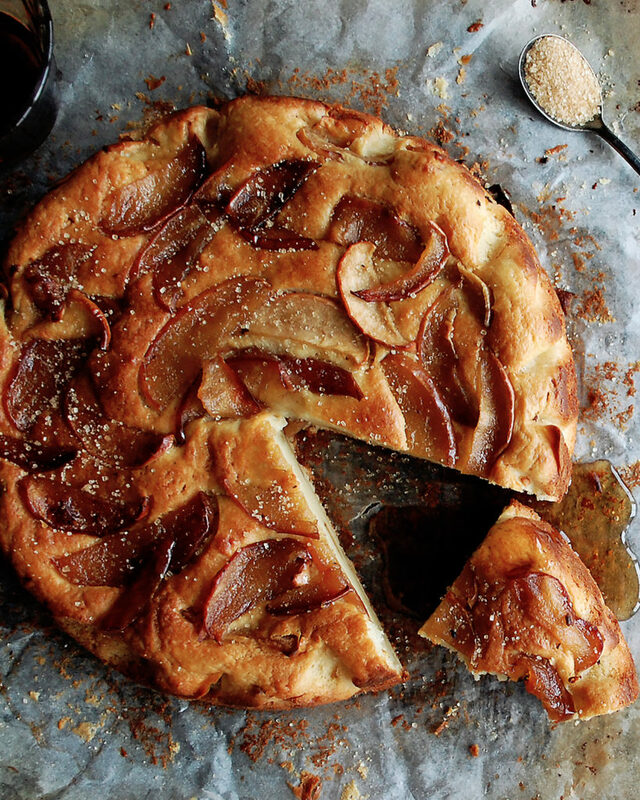 It constantly shows up on their roundup lists of “reader’s favorite” recipes. With one look at the simple, yet deliberate ingredient list, I knew it would be a keeper. 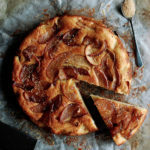 While I never got around to making the raspberry version, I did put a fall spin on it with this maple apple ricotta cake. And it is to die for. The main thing I love about this cake is the texture. It is somewhat dense and has this custard-like center. It’s also not too sweet, so it’s a great option for breakfast. Served warm and drizzled with a little maple syrup? SO perfect. 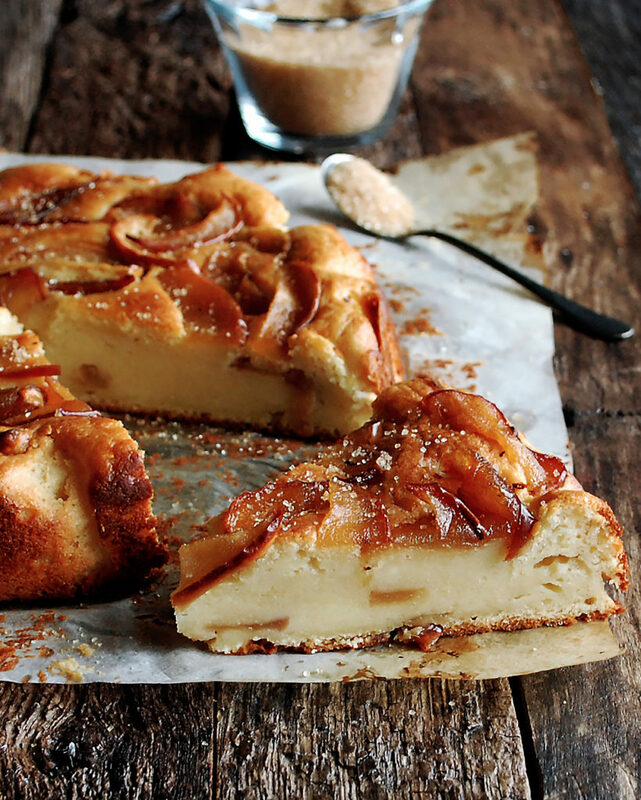 It’s studded with caramelized maple apples, a swirl of brown butter, and creamy ricotta cheese. 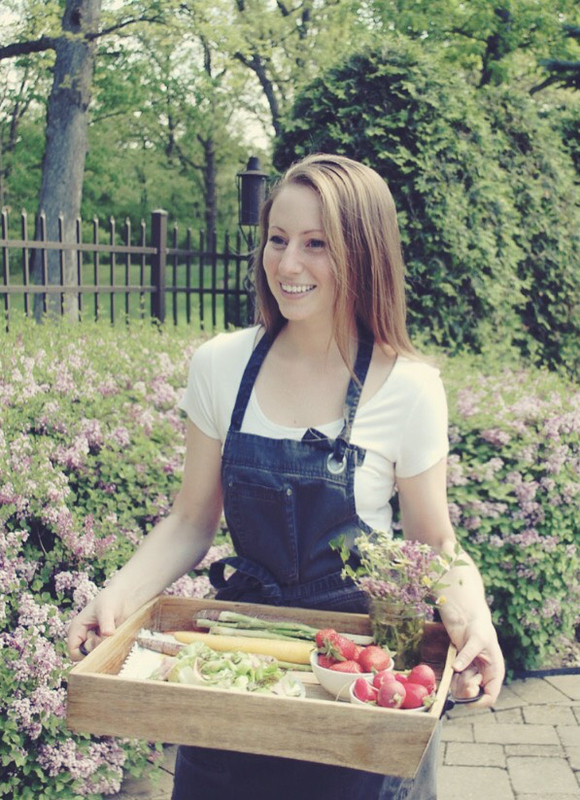 I am absolutely loving ricotta cheese in everything right now, both sweet and savory dishes. I think this would make for the best Thanksgiving breakfast to start the day on a really lovely note (even though it will be a toss-up with these doughnuts), or even for an afternoon snack with a hot cup of coffee. 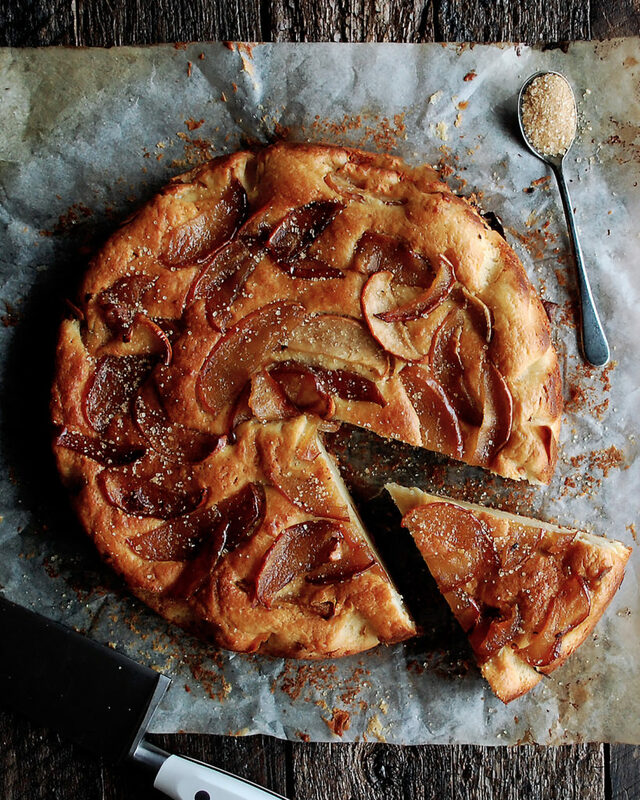 Either way, I will definitely be making this maple apple ricotta cake all week long! And I hope you do, too. Enjoy! Heat a large sauté pan over medium heat. Add the butter. Once the butter has melted, add the apples. Season with a pinch of salt. Let the apple sauté until soft and caramelized. Add the maple syrup and bring to a simmer. Lower the heat and simmer for 2 minutes. Turn the heat off and set aside. Let cool slightly. Preheat the oven to 350°F. Line a 9” cake pan with a piece of lightly oiled parchment paper. Add the butter to a sauté pan and let it melt over medium-high heat. Continue to cook until the butter browns slightly and smells nutty. Let cool. Combine the flour, sugar, baking powder, and salt together in a mixing bowl. Whisk until incorporated. In a separate bowl, crack and beat the eggs. Whisk in the ricotta cheese, brown butter (from above), and vanilla extract. In two batches, fold the dry ingredients into the wet ingredients until smooth (don’t overmix). Lastly, fold in ¾ of the maple apples. Pour the batter into the prepared pan and smooth out the top. 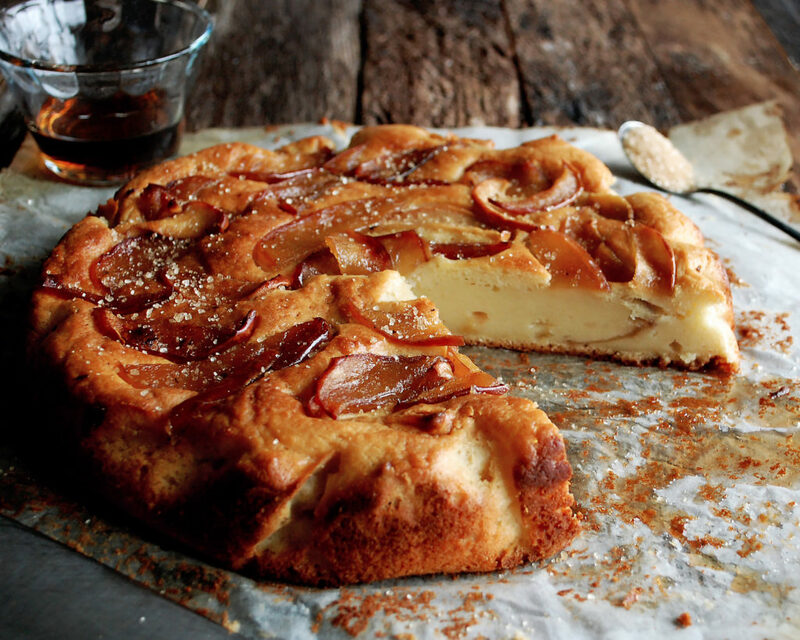 Arrange the remaining maple apples across the cake, gently pressing them into the batter. Bake the cake for about 45-55 minutes until cooked through. Remove the pan from the oven and let the cake cool for 10 minutes. After 10 minutes, lift the parchment paper to retrieve the cake. Cut into slices. Serve warm or at room temperature with a sprinkle of raw sugar and a drizzle of warm maple syrup. What kind of apples do you recommend for this – sugar/acid balance? 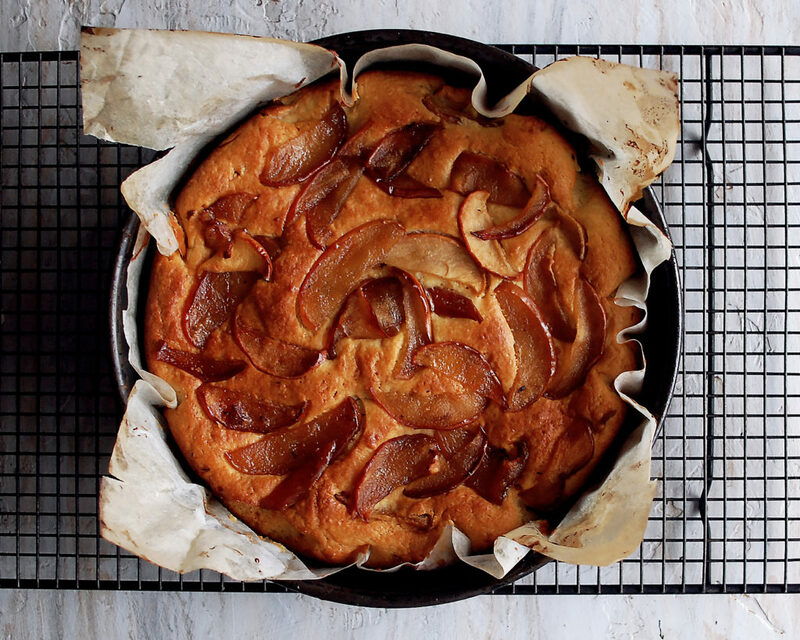 I used Braeburn apples for this cake if you can find them. They are super crisp and don’t become mushy when baked. Honeycrisps would also work well. Anything that holds their shape while baking. Hope this helps! Could I use a spring form pan for this? Hey Jessa! I haven’t tried it in a spring form, but I’m pretty positive it would work well. I might create a new flavor of this same cake soon and will have to give it a try. Let me know if you try it out! I just made this and I think it turned out pretty well – but I wasn’t sure if I should’ve poured all the syrup from the apples into the batter? I didn’t really get the custard-y center and I wonder if that’s why. Oh, I would love the answer to the same question! This looks like it could be lovely to make, so I’m curious to know the right steps to follow. See answer above 🙂 I hope you get to try this!! One of my favorites for fall. Yes, definitely pour in all of the syrup as well! It’ll help with sweetness and texture. But it also sounds like you might have over-mixed the batter. That would affect the texture the most. Let me know if you get to try it again! Another question (to the one I left as a reply above) – how thinly do you recommend slicing the apples? And am I right that you left the skins on? Thank you so much! Yes, skins on! I kind of like the extra texture in there. You’ll want to cut them fairly thin for this. They shouldn’t be wedges, but rather slices about 1/8″ thick. I like to take the apple and cut large chunks off of it around the core, and then slice them from there. Let me know if this helps!! Oh my, this looks absolutely to die for. Thank you for all your wonderful recipes! You are WELCOME! I am so glad you’re following along. I hope you get to try this cake! Have the best weekend. I typically keep it out at room temperature, wrapped in plastic wrap. It lasts for about 3-4 days. I hope you love it!